The Icelandic sheepdog is the only known breed that originated in Iceland. This breed is distinguished by its prick ears and curled tail. This hardy, athletic, and intelligent breed was developed to herd livestock in the mountainous regions of Iceland. Coat and color: It has a waterproof double thick coat, which can be short or long, and in a variety of colors: fawn, cream, chocolate, black, and gray. All variations have white markings and sometimes have a black mask. The Icelandic sheepdog is native to Iceland, which is the only breed to have originated there. This rare dog is also one of the world’s oldest breeds. The Icelandic sheepdog is believed to have been brought to Iceland with the Vikings, who settled there toward the end of the ninth century. Over the centuries, these dogs adapted to the harsh terrain and the needs of Icelandic farmers and shepherds. The Icelandic sheepdog would commonly protect flocks and herd sheep and cattle on the rough terrain of Iceland. When they were not working in the field, they would serve as wonderful companions to their owners and loved ones. 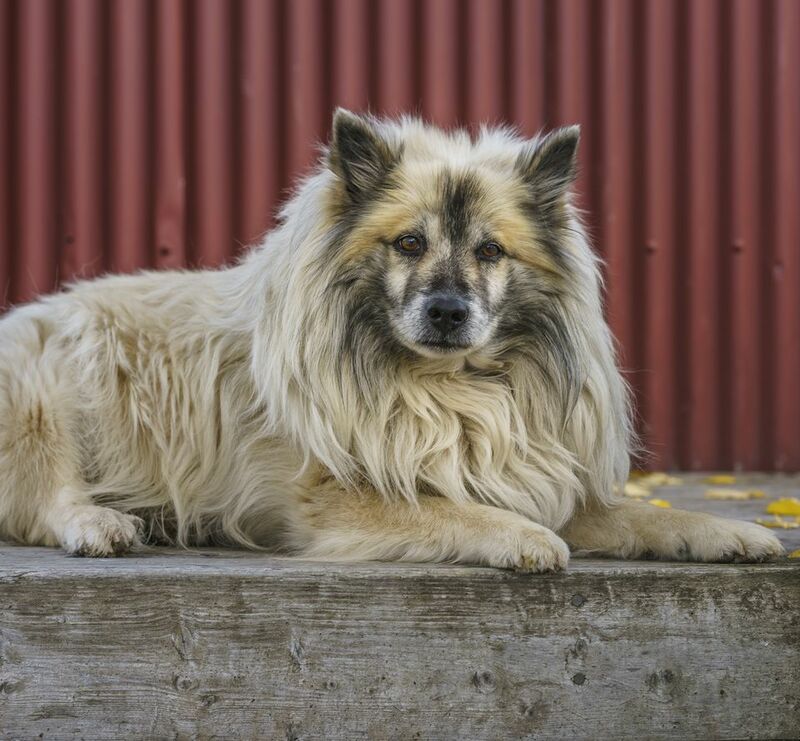 As farming needs declined in the 20th century, the Icelandic Sheepdog neared extinction. Recently breeders in Iceland and other countries have helped to reestablish the Icelandic sheepdog, though it is a rarer breed. The Icelandic sheepdog is American Kennel club’s 166th breed and became eligible for AKC registration in 2010. The Icelandic sheepdog's coat can be short or long, with both lengths having an outer coat and an undercoat. Although, they have thick double coats, they only require minimal grooming. Brush the coat once to twice weekly to remove loose fur and prevent matting. Due to the undercoat of this breed, they do experience a loss of their coats twice a year. During these times of extreme shedding, brushing is recommended more often to help manage the excessive hair. Bathing is not needed regularly with this breed as the coat is relatively easy to keep clean and healthy with regular brushing. As with other dog breeds, nails should be trimmed every three to four weeks as needed. Icelandic sheepdogs are athletic, active, intelligent, and have a lot of energy, so routine exercise is important. Herding breeds are great, but their brains and active traits mean they need a mix of mental and physical exercise to keep them happy. To keep these pups physically and mentally healthy, try including puzzle toys, agility, scent work, long exploratory walks, runs, and training throughout the life of the dog. Icelandic sheepdogs are people orientated, so provide positive social interactions with others. Without proper physical and mental exercise, the Icelandic sheepdog may become destructive, stressed, or develop other behavioral problems. As with any dog breed, proper training is needed for the Icelandic sheepdog. This breed is intelligent, and when trained with consistency and patience, this dog learns quickly. It responds well to positive reinforcement with toy and food rewards, a stable routine, and lots of love. This breed is known to be vocal, mostly barking at other animals. It stems from their origins when they would alert their owners of danger out in the mountains or open plains. Knowing this, it can help you understand why these pups bark at anything and everything they see or hear—it is normal behavior for this breed. This is a habit to discourage when the dog is a puppy. As with any herding breed, they are more likely to car chase and run after small animals, so you will need to keep the dog leashed or in a fenced yard in areas where cars pass often. Teach the dog a good recall command early in its life, this skill can be extremely helpful as the dog gets older. Overall, the Icelandic sheepdog is very friendly, playful, affectionate, an enthusiastic learner, and makes a great companion. However, be aware that this breed is very active and excessive barking can be normal behavior, which would rule out an apartment as a suitable home. Annual vet visits will help your pet maintain optimum health and prevent and recognize any problems sooner. If you intend to buy an Icelandic sheepdog from a breeder, ask about any health tests given to the parents. The Icelandic sheepdog should be fed a diet appropriate to the dog's age and activity level. Always make sure that they have clean and fresh water that is easily accessible and available. Check with your veterinarian if you have any questions or concerns about your dog's weight or diet. Before you decide on a dog, be sure to do plenty of research and involve your entire family in the decision. Learning more about the breed helps set both your family and the dog up for success. There are so many amazing dog breeds to choose from, so be sure to check out our other dog breed profiles to find the perfect companion for you and your family.